Noreen and I were invited today for a special tour of Bt Brown which included a presentation by Noreen at Chia Hood Theam’s grave site. She gave an excellent talk about the Chia family and passed around for viewing, old family photos to the group that was present (about 40 showed up). 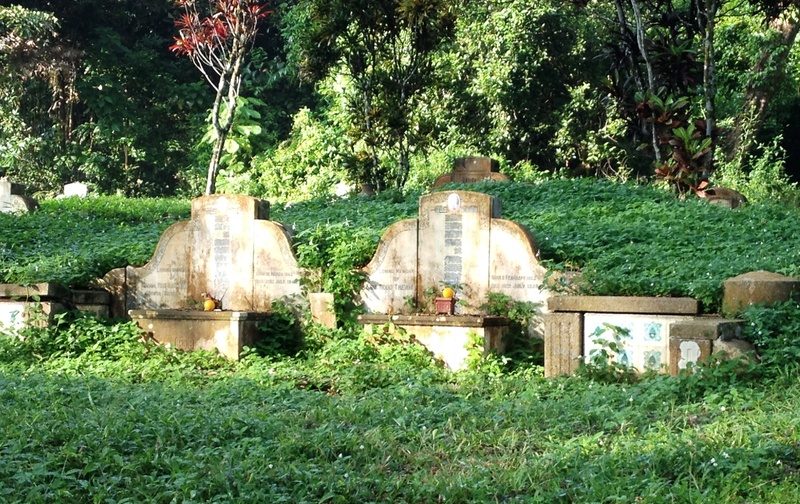 This is an updated photo of CHT’s grave that I took earlier, before the meeting started this morning. Noticed that the grave of CHT’s brother Chia Hood Sang can be seen in the background, peeking out just behind CHT’s gravestone. Noreen, looks like even in death, the great-grand parents of both your mom and dad are within view of each other. You should get your family members to take a group photo one day, standing somewhere between Chia Hood Theam’s and Chia Hood Sang’s graves. Correction, it should be Hood Cheng and not Hood Sang, who was your dad’s great-grand father (by adoption). Anyway Chia Hood Theam was still the birth great-grand father of both your parents. « A Tree fell onto Chia Hood Theam’s grave!